Passion For Promarkers challenge colours this week are COOL AQUA and PASTEL PINK. They have also specified a sketch, which must be used. What a lovely card. I love the image. Well done. Teri this is soooo cute!!! Love that image and the balloon! Super job with the coloring! Beautiful work! This is just adorable Teri! Great job..great colours and great colouring! Ah Teri you never dissapoint hun, this card is just fab....too cute for words, thanks for playing along at PFP. beyond cute, beyond adorable. This card is one of the sweetest cards EVER! You're always making magic. 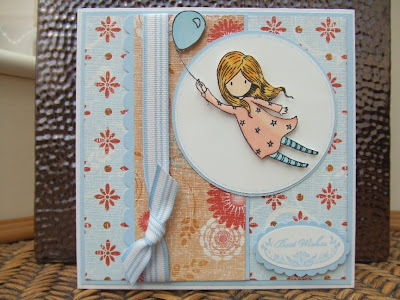 Beautiful card, wonderful sweet colours and fab image. Beautiful card. Thanks for joining us over at PFP.